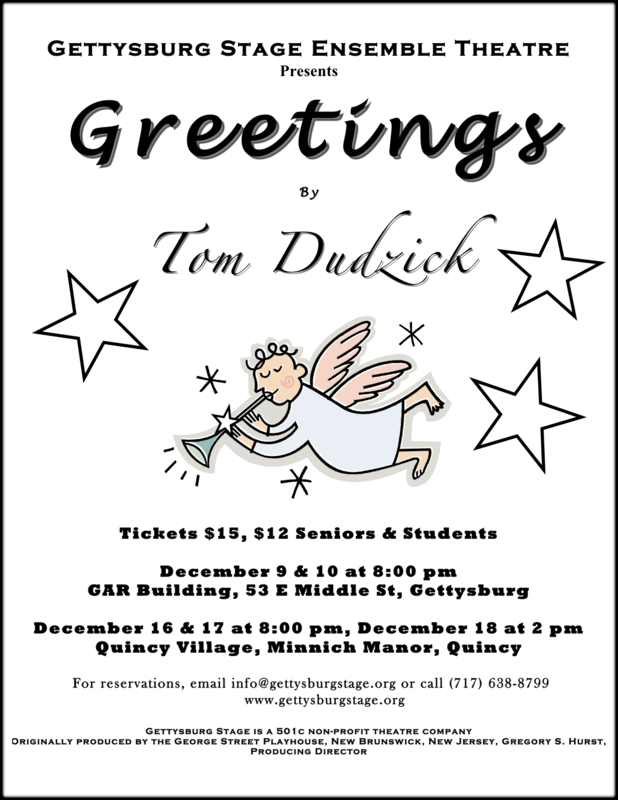 Gettysburg stage is proud to present its comedic holiday production, Greetings! directed by Hilary Snesrud and written by Tom Dudzick. Greetings! begins simply enough. Andy brings home his Jewish atheist fiancée to meet his sweet Catholic mother, sour Catholic father, and mentally-challenged brother, Mickey, on Christmas Eve, setting the stage for an explosive family affair. But when Mickey becomes the focus of an unexpected miracle, the family learns how much more important love and family are than the issues that have divided them. Hilary Snesrud is excited to be directing her first full-length play for Gettysburg Stage. “Greetings! is a wonderful play and I have a talented cast, so audiences are in for a real treat. It’s our chance to bring a ‘delicious sense of mystery’ to the holiday season for our audience. This is Gettysburg Stage’s second annual Christmas show and I’m so happy that we are continuing the tradition. I hope that we will continue it for many years to come.” Appearing in Greetings! are Kelly Clark, David Hurlbert, Jeff Leinbach, Trevor Taylor and Elizabeth “Buff” Wills.